There are numerous recipes for jhal muri, which is also known as jhaal muri or jhalmuri. 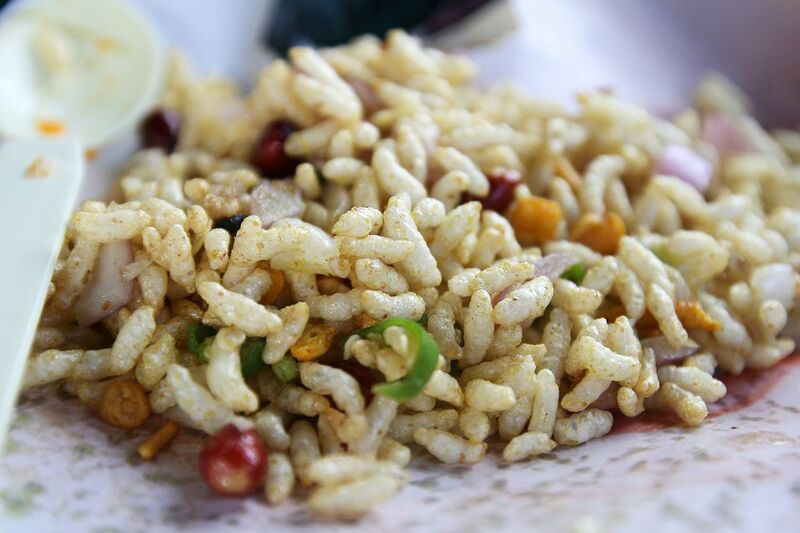 Jhal, referring to being very spicy, and muri, meaning puffed rice, is a delicious Bengali (East Indian) snack and often served as street food in Kolkata. This recipe is easy to throw together in just a few minutes and makes a terrific light lunch or evening snack. It is often made with different spices, depending on the recipe. Jhal muri is sometimes prepared as a soup with tomato, pudina (mint), or cucumber and can also be served in a bowl or a thonga (a paper cone). Other versions may include peanut, coconut, potatoes, green chilies, mustard oil, lemon, coriander leaves, or a sprinkle of sev (fried semolina). Various mixes include garam masala, bay leaf, and amchoor (a dried mango powder). Sometimes, spices are ground together and then sprinkled over the rice. Most of the ingredients are available at Indian grocery stores. Place all of the ingredients in a bowl. Mix them together and stir well. Season the mixture with salt to taste. Serve the jhal muri immediately in bowls so it does not get soggy. When shopping for the puffed rice, you may find it labeled as "murmura," "mamra," "muri," or simply puffed rice cereal. Chanachur (or chana chur) is a snack mix in itself and is sold in many different flavors like extra hot or sweet and sour. It can be a combination of various ingredients, such as gram flour, parched rice, groundnuts, and spices, or cashews, potato strands, and moong beans. Choose what seems most appealing to you. Sev is deep-fried chickpea flour noodles that have been seasoned with cayenne, turmeric, and ajwain. When making it at home, some people toast the puffed rice prior to assembling it, but if you store the puffed rice fresh (in a dry, air-tight container) you will not need to roast it again. For those who do roast the puffed rice, make sure not to keep it in the oven too long. If the recipe takes too much time to make, it can get too soggy, so be sure to keep moving along since the crunch is a crucial part of the dish. This Indian snack can take on many different ingredient combinations changing the taste and texture of the mix. You may find a recipe including boiled potato, ginger, aloo bhuja (a potato snack), chopped tomato and cucumber, and mustard oil, while another features fried lentils, mung bean sprouts, chat masala, and garam masala.